Known for its friendly candlelit atmosphere, this cozy retreat is off the much beaten tourist traps, tucked quietly away in the Sino-Portuguese quarter of old Phuket Town. The combination of Thai and fine French style cuisine and wide selection of wines, makes this a popular dining choice. 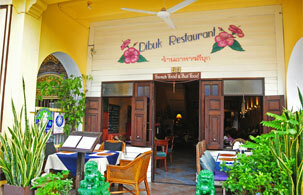 The atmosphere and attentive staff make this a real must for both locals and visitors to Phuket. Recommended dishes of the restaurants chef and owner – le pâté de foi de volaille followed by les cuisses de grenouille served in a garlic butter sauce. For a main course try the mouth watering la rai aux capres (sting ray with cappers in a butter sauce). The banana flambé is a desert to try. The crazy maitre d invites you to enjoy a remarkable dining experience and share her passion for quality food. For a casual dining experience or romantic setting with a special flavour of French cuisine, this is an enjoyable and relaxing place to go.